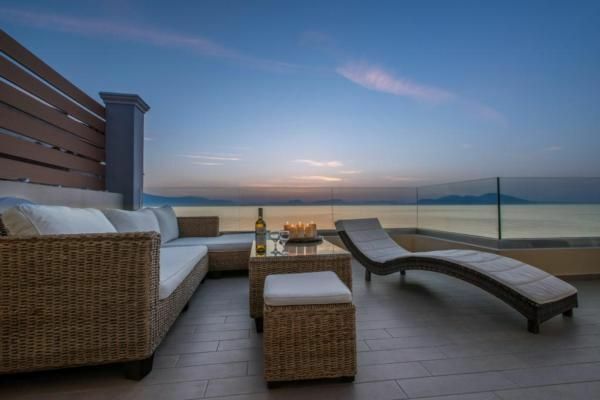 80 sqm private suite is located in front of the amazing beach of Sikia in the Corinthian Gulf . So you can reach the beach just by making only 3 steps! The apartment has a large balcony with sunbeds and dining area! The view from the spacious balcony is amazing and it gives you the opportunity to enjoy great meals at any time of the day.The apartment includes 1 master bedroom with a double bed,1 bedroom with 2 single beds,bathroom with washing machine, WC, living room with a big dining table ,fireplace and a sofa bed that turns into s comfortable double bed, cable TV,DVD player , Wi-Fi, and fully furnished kitchen with facilities such as fridge,oven ,dish washer,kettle, coffee machine, microwave. Sheets and towels provided. Private parking . During summer periods the apartment has an air conditioning system and during the winter includes heating system. All of the facilities are in walkable distance! Furthermore at the front side of the house you will find a breathtaking scenery! The beach nearby it is a beautiful pebbly bay with crystal clear waters ! Most of the days in summer the sea is peaceful so that it will be easy for those who doesn't swim very well! On the one hand at this bay you can find organized beach with sunbeds and umbrellas for coffee , seaside greek " Tavernas" with traditional food but also more quiet areas for relaxing ! Just 5 minutes walking distance from the house there is a serene pine forest called Peykias.In Peykias there as about 83 different tree & plant species and it is an ideal place to play tennis, beach volley, jogging or simply for a walk in this magnificent environment.